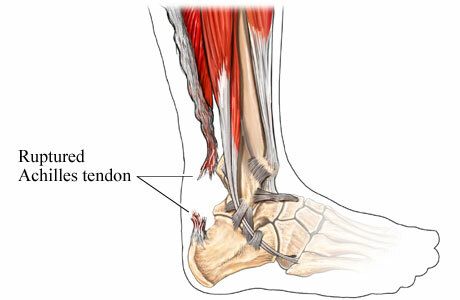 This occurs when the Achilles tendon tears, most often during sport when the knee is extended and the ankle dorsiflexes. 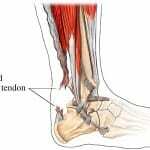 The load during this can be too high for the tendon to take and it then tears. You know when it is happened as there is a gap in the tendon and you can’t raise up on your toes when standing. Put ice on it and get to the doctor. There is nothing you can do yourself! They will do one of two things. It will either be put in a cast or walking brace or it will be operated on. All the research has shown that the outcomes of the two methods are exactly the same, so it probably does not matter which methods is used.